Who said tattoos can't be painless? 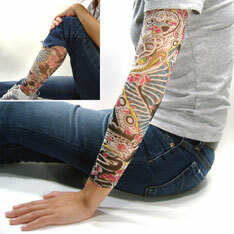 These tattoo sleeves are a fun way to display your love of body art without having to commit yourself. They're easy to use. Just slide it on. Use it to fool your friends. These look like real tattoos. Comes in assorted sizes and styles. Limited sizes left. If you're interested, please don't delay.